Ouch. Spinning MMA knockouts always look brutal and 'ouch' is going to be your overall takeaway from watching these seriously painful looking mixed martial arts spinning (MMA) knockouts. Ouch and gratitude that you're not, and hopefully never will be, on the receiving end of such brute martial arts force. Because this spinning MMA knockouts compilation features a variety of brutal spinning blows to the face of the opponent using any body part that will do maximum damage, resulting in the recipient hitting the floor of the ring completely devoid of consciousness. Be it a spinning kick, spinning elbow, or spinning punch. It's certainly something many of us wouldn't want to experience, but for mixed martial arts fighters it's all part of the job. And fans who come to watch the fights want to see an exciting bout, complete with a spectacular finish. And a spinning limb to the jaw is exactly that. Spinning MMA knockouts come in all forms but the pinnacle of these is the spinning kick. It needs to be landed correctly, which is a feat in itself, but if it is it's pretty much guaranteed to be a devastating strike. Any opponent who gets one in the face is going down like a lumbered tree. There are many knockouts featured here in this wince-inducing seven minute plus video compilation. Some of them are renowned as some of the best spinning MMA knockouts ever seen from mixed martial arts fighters. For example, Junior Dos Santos versus Mark Hunt from UFC 160 which is a remarkable knockout, not just because a spinning kick was used, but because it was done in a fight between two heavyweights. Amazing. 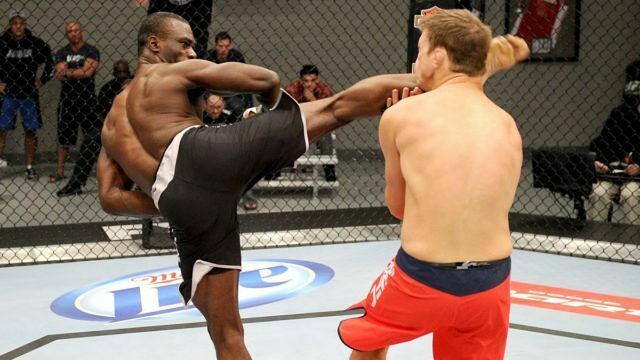 "While spinning kicks aren’t too often seen in MMA period," notes MMA fan site Low Kick. "It’s a rare sight to see MMA knockouts from a bulldozing heavyweight have the ability to execute such a crafty move, but that doesn’t mean it hasn’t happened before." So we see Junior “Cigano” Dos Santos take down his Samoan opponent with a "brutal spinning wheel kick." Other spinning MMA knockouts include Uriah Hall versus Adam Cella at TUF 17, and Edson Barboza versus Terry Etim at UFC 142. The latter, which features at the very beginning of the video, sees Muay Thai expert Barboza knock down Etim with, according to Low Kick, the "best spinning kick knockout of all-time." Check out some of the MMA fighters below.